Here is a mathematical model of tree growth. It isn't as beautiful as those from Hollywood, but it has a strong point: scientific realism. It was a maple tree. 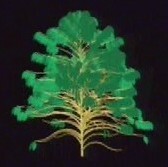 This model stars a conifer, which signifies that the mathematical growth model must be radically different from the previous one, for a leafy tree. Scientists develop mathematical tree growth models that are increasingly refined. Are they seeking the Holy Grail of the plant kingdom? By developing matrices that are closer and closer to reality, researchers try to understand trees and their development response to varying environmental factors. Our model was a Douglas fir. Here is a coffea plant, which, although arborescent with multiple trunks, does not fit the classic definition of a tree. Making a model of it is a whole new puzzle! Since the coffea plant provides us with a prized commercial resource, the effort is worth its price. What conditions would give the most grains? A good model could predict it. Different parts of this poplar have different ages. To understand tree growth, one must visualize each one as a colony. In blue, the trunk. In green, the main branches. In red and yellow, the twigs. Each part of the tree has a different physiological age. From blue to yellow, age increases. 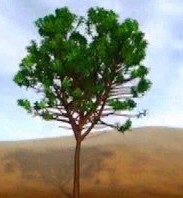 The parts of the tree are divided according to age. followed by the main branches. The long and short smaller branches are the youngest. For example, it's believed that this Norway spruce is 9550 years old. Yet, its trunk, regrown from its roots, is "only" 600 years old. And its branches? 100 years old, maybe? Youthful adolescents!